OLD TOWN TRIANGLE — The Commission on Chicago Landmarks delivered a split decision on the proposed demolition of two Old Town residences. The commission denied a request to tear down a prototypical workers cottage at 1639 N. North Park Ave. 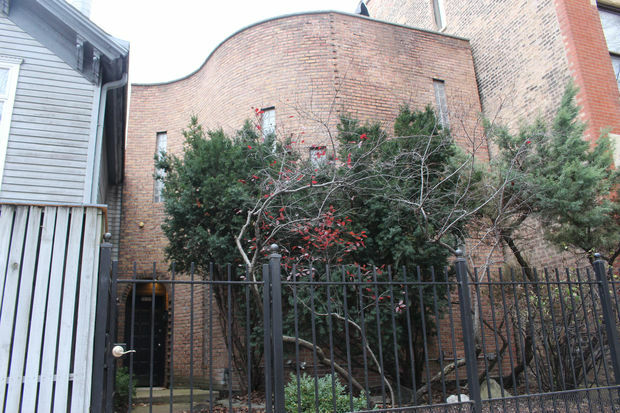 But it did not offer the same protection to a quirky building with a curved facade at 1638 N. Sedgwick Ave. designed by architect Edward Marks. For the most part, the commission followed its own bylaws in the rulings handed down last week. City attorneys had argued at a public hearing in December that the workers cottage was emblematic of homes built in the Old Town Triangle District after the Great Chicago Fire in 1871. The only issue, they said, was whether the cottage contributed to the district as an example of a workers cottage of the era. The argued it did. The commission agreed. Ward Miller, executive director of Preservation Chicago, said the issue was clear-cut. “When one thinks of Old Town and the Old Town Triangle Landmark District, the first visual image I have is of these cottages with the tall stairways that go up to the high first floor,” Miller said Tuesday. He cited their “incredible charm,” as well as the innovation of the era with its balloon-frame construction. The commission did not extend the same protection to Marks’ mid-’60s brick building on Sedgwick with its distinctive curved front. Although the commission originally went against the advice of its own staff and denied demolition at a meeting last month, it ultimately determined last week that it had no legal ruling to stand on, as the quirky building was not typical of the district, even if it was emblematic of iconoclastic design in Old Town in its mid-’60s heyday. Miller argued for preservation, saying it was “very much in the spirit of Edgar Miller and company” in buildings already landmarked on Burton Place and also on Wells Street. But since the building wasn’t designated as a landmark, the commission determined it couldn’t stand in the way of demolition. The owners also argued that one person in the house used a walker, and the curved facade did not lend itself to any sort of access ramp. The ruling goes to the City Council for final approval for demolition. It wasn’t a total loss for preservationists. “The landmarks commission did recognize that there are buildings of the modern movement that are important,” Miller said. Chairman Rafael Leon, he added, requested a “context statement” be drafted by staff that would offer some protection to midcentury modern buildings short of them being landmarked. That should be prepared early this year.